Early examples of new ventures performed during Mouchel's lifetime included jetties in Liverpool and Purfleet near London, and warehouses in Brentford and Plymouth for the Great Western Railway Company; a skew bridge in Chewton, Somerset  the first ferro-concrete bridge in the UK  and the UK's first bowstring girder bridge in Purfleet, a 91m long viaduct with a span of 18m. By 1910, LG Mouchel & Partners had designed more than 600 completed works, including large buildings, marine works, bridges, reservoirs, silos, bunkers and river works. In addition to such landmark buildings as London's Earl's Court Exhibition Centre and Glasgow's Lion Chambers, Mouchel the man and LG Mouchel & Partners the company were united in pioneering new ways of using a material regarded as revolutionary. The foundation stone of Mouchel's business  ferro-concrete  would not be forgotten. After Hennebique's death in 1921, LG Mouchel & Partners joined up with another Hennebique engineer, Monsieur Foort. They became well established not only in the field of reinforced concrete, but also in many fields of general engineering. In 1924, LG Mouchel & Partners negotiated with the City Electrical Engineer of Liverpool for the installation of reinforced concrete cooling towers at Lister Drive Power Station, the norm at the time being timber construction with a life expectancy of 15 years. With knowledge of hyperbolic concrete towers constructed in The Netherlands, the company designed 12 towers for Lister Drive, introducing the soon-to-be ubiquitous hyperbolic curve to the UK. The company went on to design more than 350 towers round the world. Other landmark LG Mouchel & Partners projects included Liverpool's Royal Liver Building. Once described as 'Britain's first skyscraper', the Liver Building would form the focal point of the city's 'Three Graces', and at 98m in height, remained the UK's tallest building until the 1960s. Other significant projects included Royal Victoria Dock, and stands for Liverpool and Manchester City football clubs. The company also designed the cooling towers for Battersea Power Station, which form the skyline of London south of the River Thames. 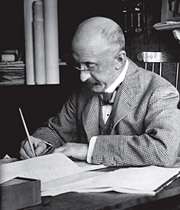 Louis Gustave Mouchel's legacy survives not only in the reinforced concrete structures that have influenced modern British architecture, but also in the traditions and innovations continued by the company he established. In 2007, LG Mouchel was awarded a centenary certificate from Companies House, recognising that the company had been a legal entity for more than 100 years. The grain steamship SS Armistica was built and launched in 1919 (scuttled 1969) in Barrow-in-Furness to L.G. Mouchel & Partners specifications. She was the first concrete ship of any kind to sail down the River Thames. 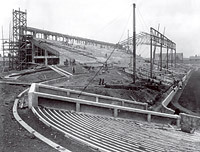 Manchester City Football Club stands at Maine Road under construction (1923): engineering design by L.G. Mouchel & Partners. Interior of the Mouchel-engineered Earl's Court Exhibition Centre (1937) in London  one of the largest reinforced concrete buildings in existance when it was built.